With the long weekend coming up, many New Zealanders will be hitting the roads exploring other regions. For those of us who simply adore “stuff”, the holiday weekend provides a great opportunity to pick up items from our travels. 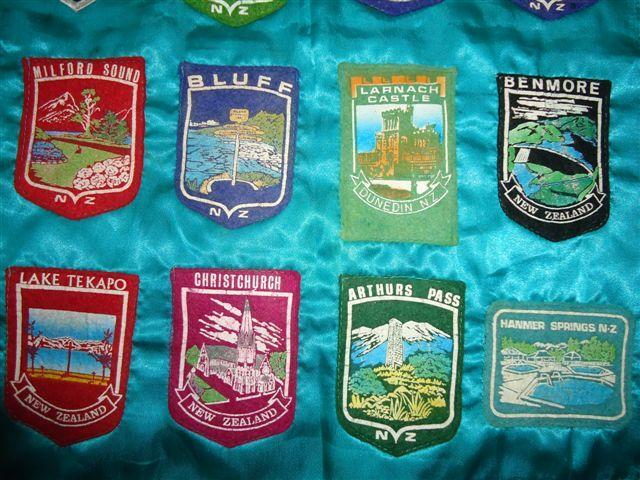 This got me thinking about the classic fabric souvenirs from tourist patches to pennants. What actually happened to them once they had been handed over to an excited kid? Were they sewn onto blankets, bed linen or clothes? Perhaps they were used to cover up worn areas of clothing, making them drab to fab? The above sheet was purchased from a Wellington op shop. I was intrigued by the various South Island destinations from the West Coast, Bluff to the now poignant image of the Christchurch Cathedral. Was this the result of a major tiki tour or perhaps years of intermittent trips around the South Island? 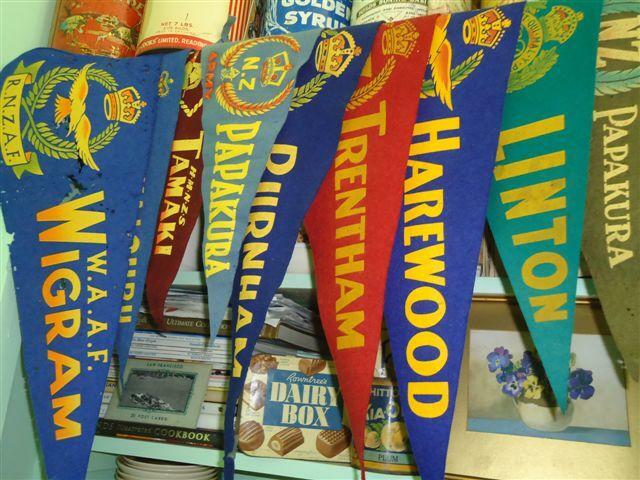 Pennants from my childhood trips are from the North Island with the glamorous destinations of Auckland Zoo, Waiouru Army Museum and Lower Hutt all represented. 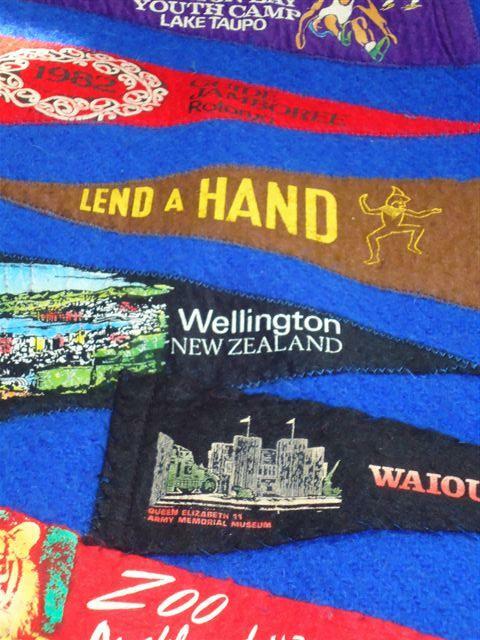 Other patches from the Treaty of Waitangi House in the Bay of Islands, Hamilton and Taupo complete the collection which was later sewn onto a Girl Guides blanket. I struggle to remember anything from these trips, so it’s wonderful to have these fabric reminders. 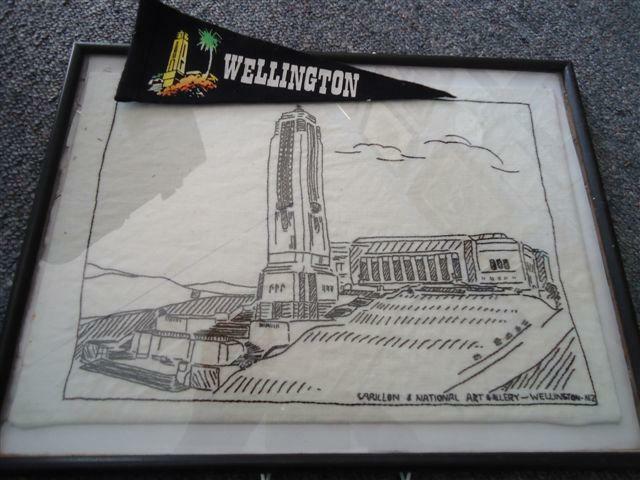 I particularly like the above Wellington pennant as it features the National War Memorial. It is displayed next to an embroidery of the National War Memorial and the former Dominion Museum/National Art Gallery. Extending the military theme is a collection of pennants representing New Zealand bases and camps. Most of them are Army but you can find examples of all three services at antique shops. Do you have any examples of fabric patches or pennants? If so, how were they used or displayed? Happy holidays and happy hunting! I don’t have any patches or pennants, but I do find myself the owner of a few mid-century souvenirs, thanks to my nan. Not fabric though but a royal tour 1953-53 plate, dish, beer glass, commemorative coin and brooch. I’m not in the least a royalist, but I’m very fond of them. I wonder if royal tour patches were sold? I must look out my old Girl Guide blanket. These were worn poncho style to camps and evening ‘pow wows’. You sewed all your badges and collectibles onto them and a ‘full’ blanket was a bit of a guide status symbol. I must report mine was a bit lean. I will dig out also my old lifesaving tracksuit. Back from the days when tracksuits were made of warm blanket type fabric. 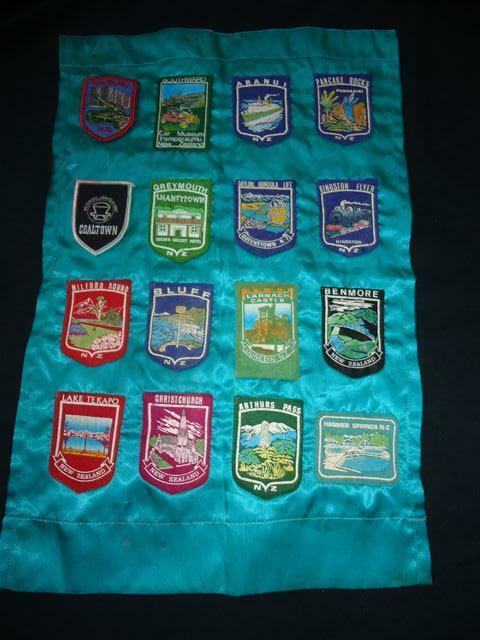 Again these were adorned with pennants and badges and collectables from surf carnivals etc. Mine has some lifesaving memorabilia and basketball pennants (as in the currently popular ‘indoor’ variety).